This project is going to make me rich! Your energy meter will not be able to see the load you connect to the power outlet of this device, no matter what type of load you connect to it, as long as you leave your Mooshimeter unconnected. For instance connect a 1000 Watt heater to the power outlet and your energy meter won’t even notice it. There’s only one little snag. Unfortunately the connected load is not working. But once I have solved this small issue I’m sure I’m going to be rich! The good thing about this project is that if you do connect a Mooshimeter to it you can instantly see how much you would have saved if my plan had actually worked. Let's put the jokes aside now. I have bought myself a Mooshimeter. You can read my review here. The nice thing about the Mooshimeter is that it can measure two channels simultaneously, which allows it to measure real power, apparent power and the power factor of a load connected to the AC mains. Hooking up the Mooshimeter to your device under test is not really rocket science. 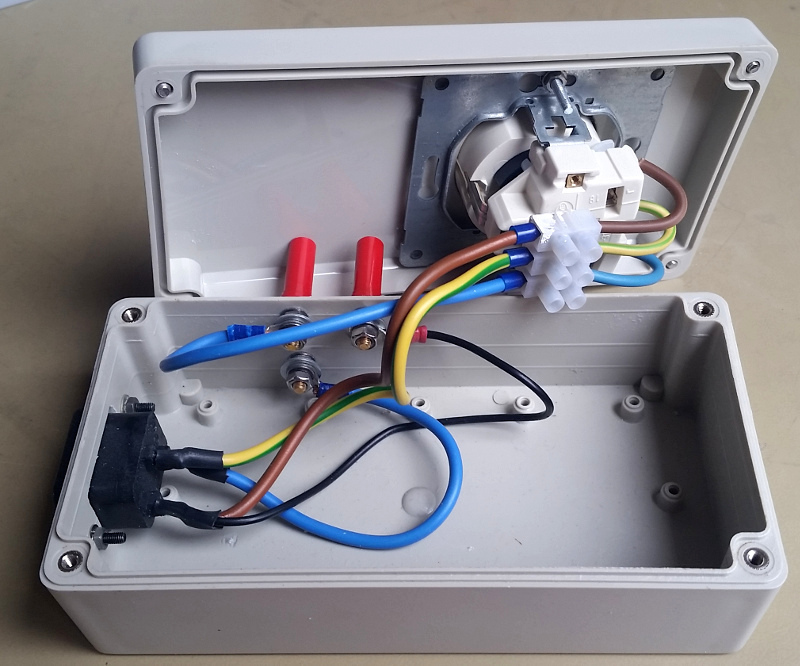 But the wiring can be a bit messy and because of the exposed wiring it might even be dangerous when you’re working with mains voltages. And there’s always the risk of making a wiring error, causing a short circuit, which will very likely blow the fuse of your Mooshimeter, and nothing else if you’re lucky. Normal, exposed binding posts would be very dangerous because they carry live voltages! Make sure to use shrouded binding posts. Because measuring the power consumption of appliances is such a common use case I’ve decide to build this power adapter for the Mooshimeter. Simply connect the Mooshimeter to the side of the power adapter, plug the adapter into the mains and connect the device under test to its power outlet and you’re good to go. No dangerous exposed wires, no chance of wiring errors and no messy wiring any more. 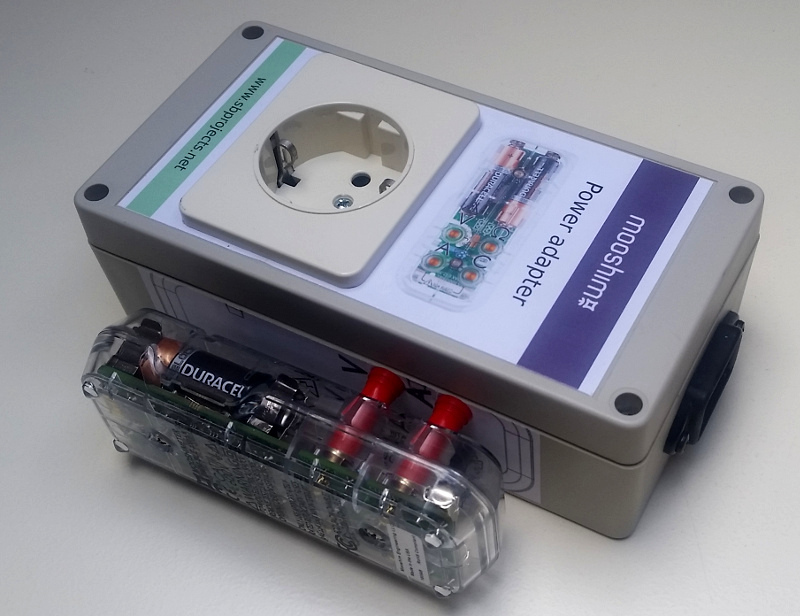 Even though it’s only a very simple project I’m sure you’ll have to agree with me that it is well worth the time spent to build one when you regularly want to measure power consumption of mains devices.